Famed announcer Harry Caray was the voice of the Cardinals for a quarter century. Beloved in St. Louis, he was known as a womanizing man-about-town. That penchant for sharing time with beautiful women just may have ended his career with his hometown team and solidified the career of Jack Buck. The unsubstantiated rumor – that Carey never denied – is that an affair with August Busch III’s wife led to the announcer’s dismissal. 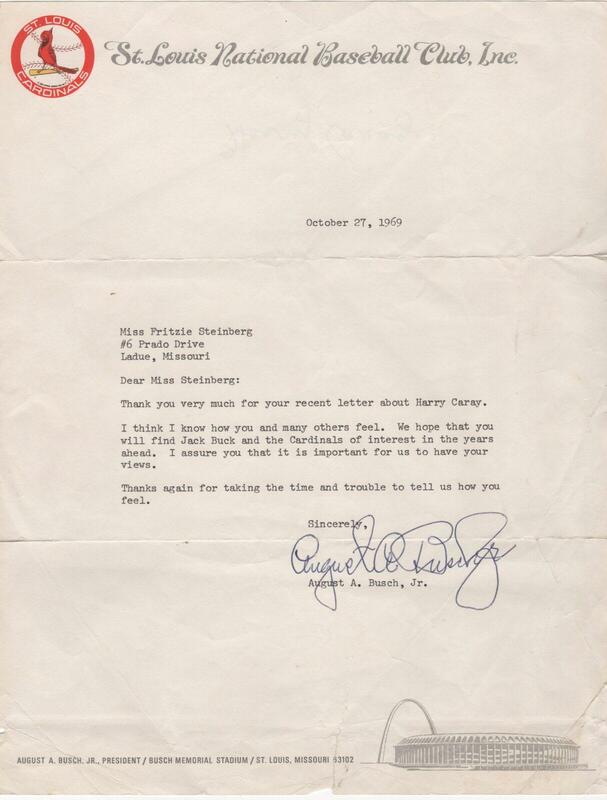 Proof of the affair supposedly came to light after Caray was hit by a car on November 3, 1968 and nearly lost his life. The Busch family phone bill for the month showed many calls to Caray’s hospital room. The charges were traced to Susan Busch, the young wife of August Busch III who was the son of the team owner. The story continues that the Busch family hired a private investigator who confirmed that Mrs. Busch was indeed romantically linked to Caray, who was then in his 50s. 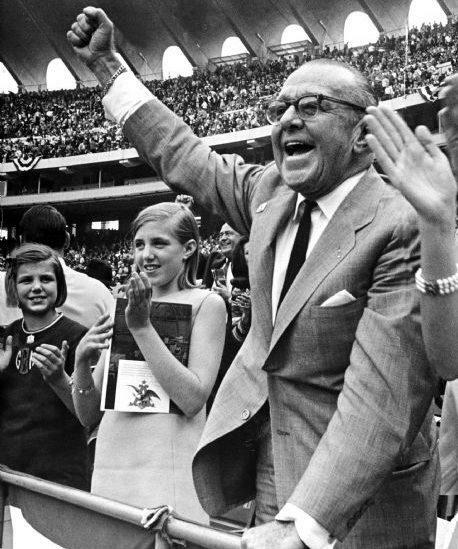 Whether the story is true or not, Susan and August Busch III were divorced in 1969, the same year the Cardinals opted not to renew the contract of the immensely popular Caray. On October 9, 1969, Gussie Busch Jr., who’s tenure as club owner included six pennants and three World Series crowns, told Caray of the club’s decision. The Cardinals put their faith in 45-year old Jack Buck. That faith would pay dividends for the club and for Buck, who would be honored by the Baseball Hall of Fame, the Pro Football Hall of Fame, and the National Radio Hall of Fame. It is not Caray but Buck who is immortalized in the St. Louis Cardinals Hall of Fame Museum. Don’t feel sorry for Caray. The move out of St. Louis allowed him to eventually take his charismatic personality to Chicago, where he became one of the most beloved announcers in baseball history. Twenty years after leaving St. Louis, Caray received the highest honor baseball bestows on announcers – the Ford C. Frick Award. Today, a statue of Caray is on the corner Sheffield and Addison just outside of Wrigley Field. Did the affair actually happen? 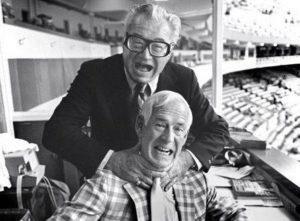 If not, was the rumor so strong that it forced the Busch family to fire Caray anyway? Few will ever know for sure. What’s certain is that Caray’s departure from St. Louis cleared the way for the emergence of Jack Buck and paved the way for Caray’s association with the Chicago Cubs. Both men are in the Baseball Hall of Fame. The fascinating content from Gussie Bush provides an interesting reminder of a romantic triste – if it actually happened – that changed the baseball landscape and created the conditions that helped two announcers get into the Baseball Hall of Fame.